Fawnskin is just a few minutes by car from Big Bear Lake. Drive north on Stanfield Cut-Off, thereby crossing the lake, and turn left (west) onto Highway 38, also known as North Shore Drive. Although the lake level is low because of our recent drought, you will still be delighted by scenic views of the San Bernardino Mountains, ski slopes, and South Shore across the lake. You will soon notice the Big Bear Discovery Center on your right, which provides education about the San Bernardino National Forest and hosts naturalist-led tours. In another 1/2 mile on the lake is the phenomenal Big Bear Solar Observatory (BBSO) which currently boasts the largest clear aperture solar telescope in the world. The BBSO hosts tours on the 2nd and 4th Thursdays of the month. Continuing along the North Shore, you will observe it is mostly residential with many lovely small lakeside cabins as well as majestic, landscaped log homes. 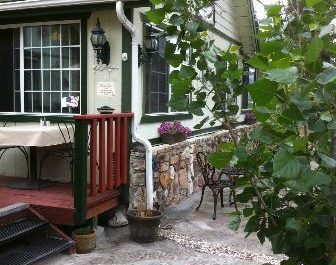 You will pass the Inn at Fawnskin, one of the most esteemed Bed and Breakfasts in the Big Bear region, and on your left, Captain John’s Fawn Harbor and Marina. There are also some great hiking trails nearby, including the Gray’s Peak Trail, Cougar Crest Trail, and Woodland Interpretive Trail. After a few winding turns, you will enter the small downtown area of Fawnskin and find the North Shore Café on your right opposite the small private Fawn Park developed by Shirley Jones and her late husband, Marty Ingels. Don’t forget to stop by North Shore Antiques and the North Shore Trading Company for some fun shopping. If you are planning to stay the night, you might also want to check out the Quail Cove Lakeside Lodge in Fawnskin which offers fully appointed lakeside cabins. We hope you will join us for a delicious meal. Our little restaurant can get quite busy during mealtimes, but most guests report enjoying the serenity of escaping to the North Shore of Big Bear Lake. P.S. When heading down the mountain, it really is easiest to continue west on North Shore Drive (Highway 38) to the dam. Then turn right onto Rte. 18, which will bring you to Rte. 330 down the “hill.” You can stock up on supplies at our clean Fawnskin Market to hold you until you reach your destination.